(Newser) – The Camp Fire in northern California has killed at least 83 people, with the number rising daily, and has displaced tens of thousands of others. Hundreds are unaccounted for. 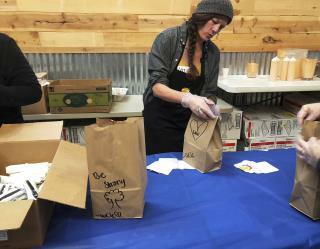 It won't be a normal Thanksgiving for any of those families, but businesses and hundreds of volunteers have stepped up to ensure turkey, potatoes, and pie are available as a small slice of comfort for anyone who wants a plate, the AP reports. Washington, DC-based nonprofit World Central Kitchen is cooking 15,000 Thanksgiving meals, teaming up with Chico-based Sierra Nevada Brewing Co., the local university, and the town of Paradise to serve them Thursday. Volunteers prepared food and set up massive tables Wednesday. Awww. That's a big project there! Hundreds of turkeys. Bless them all. If I were closer I would gladly help. Happy Thanksgiving. Have hope. We'll work on housing next. Let us all be thankful today and leave our petty bickering aside. Some of us, meaning humanity, may be going through a rough time and it may not seem that we have much to be thankful for...but try. We are alive and hopefully the future will bring good things. So today be thankful for what we have and to all on Newser I wish you a truly Happy Thanksgiving.